Quiltville's Quips & Snips!! : Time Out in the Afternoon! Look closely and you will see MY shadow across the front of this wonderful robins egg blue vintage GMC pickup truck. Wednesday afternoon had me dropping mail off at 4pm, and realizing that the Antique shops in Thomasville NC didn’t close until 6pm –and that the beautiful February sunshine and warmth (72!!) was encouraging me to spend a bit of time out and about, putting the computer work on the back burner for just a bit. Thomasville is only about 9 miles south of Wallburg, but I never go that direction. Everything that it has is duplicated in closer locations nearer to me and it is the path “least traveled.” It’s been a couple of years at least since I felt the pull to wander. But how could you NOT want to poke around in here? This small shop is SO inviting! 19th century “Serpentine” hand crank. I searched and searched for dates on the papers underneath, but couldn’t find any. It’s safe to say that these are from right around the turn of the century with these mourning prints, shirtings, reds and blues. Sometimes it feels like I’m doing an archaeological dig, uncovering bits and pieces from ages past. I left. Empty handed. The machine was expensive, and seems to be missing a bobbin winder, which could be a problem. If it isn’t working, or is missing parts, I won’t be sewing on it. And it’s too much to pay just for a display piece. But I loved it! Time to go back up the block and spend the rest of the time wandering around the antique mall. Oh my. A Minnesota A! Poor thing…the chrome is all rusted off the hand wheel. I was trying to quickly find out if this model is one that takes the long needles like my Davis. Would it even sew? The take up lever is bent at a weird angle. Could it be straightened? Or would it break off? The whole machine is pretty gummy, really. Rams Head drawer pulls. Oh, it’s wonderful. This is the most beautiful cabinet. And my mind is whirling. The machine isn’t worth the price they are asking, and yet the cabinet without machine shouldn’t be this much either. And do I have room for another cabinet? Not likely. But it would FIT my 2 Davis machines, the Vertical Feed, and the older Davis machine head which was the 2nd treadle I ever purchased “back in the 90’s.” I do have a parlor cabinet that fits those heads, but it sits too short for me to sew at comfortably…..and I went round and round arguing with myself in my mind over the possibilities and drawbacks. Answers came back via facebook that yes, this model A takes the long needles – the Boye #10. Harder to get, but not impossible. Would I really sew on it much if needles are a rarity? I don’t need more furniture!! But it is so GORGEOUS!. Yes….but the machine is not in great shape. I had a great visit with Tonia and found she had taken one of my workshops before and was still quilting, and going on retreat this weekend with her group from Asheboro. Have an AWESOME time, Tonia! So fun to run into you in an unexpected place. This sweetie was found in my wanderings. There is something just simply joyful about a basic 9 patch set in single Irish chain fashion with plain alternating blocks. I just loved this. The aqua has been added to each end, and machine stitched in place, either to make it longer, or to preserve the shredding edges, or both. I just LOVE this. The colors, the texture of the quilting, the simplicity, the everything. And yet the only thing that came home with me were photos, and two melmac serving dishes that I spent a whopping $2.00 on, but they reminded me of the dishes I grew up with. A $2.00 afternoon, and worth every penny! Dawn’s Early Light is now quilted! There is something that I just love about removing a completed quilt from the machine. For as long as it took to quilt it, you are only looking at narrow sections between the rollers as the quilt is advanced and advanced again until complete. And then some unpinning, and unrolling and there before you is the completed quilt, ready for trimming and binding. Binding went on last night! It’s a hanging sleeve, for cryin’ out loud – not a home dec item. All fabric will be outdated at some point, this way I’m ahead of the game! There is a white Millennium fabric with silver 2000s on it in the string blocks on the front, so why not? And that brings me to now. 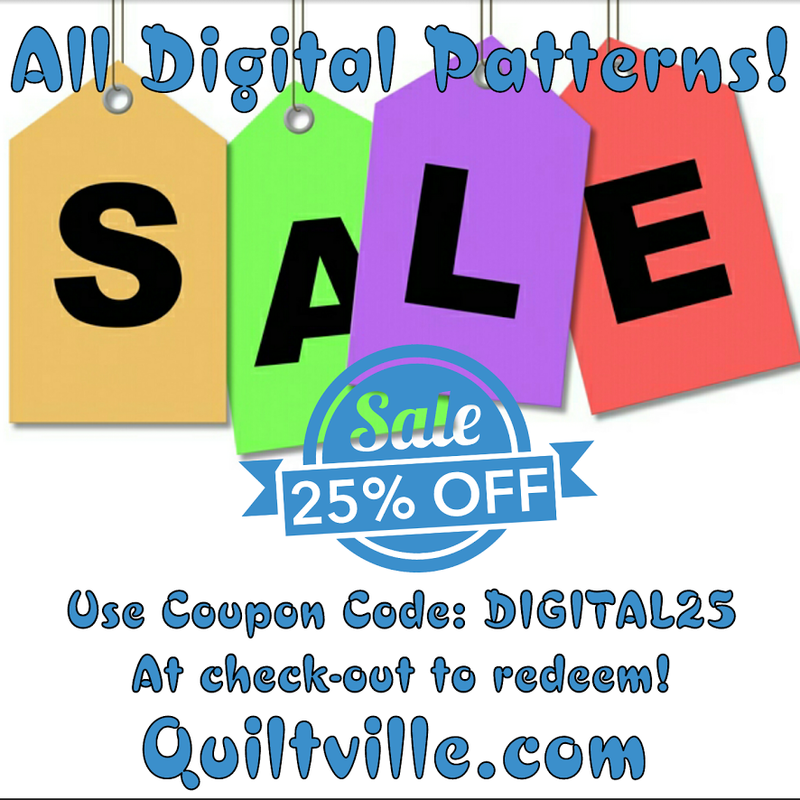 The SALE on all digital patterns in the Quiltville Store is ongoing until my return home from Texas on the 9th! If you didn’t hear about it, head over to yesterday’s post for all of the info. 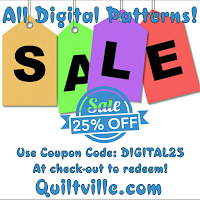 All patterns, including the newly released En Provence and Garlic Knots are 25% off. The drawing of the March/April 2017 Quiltmaker Bundle happens TONIGHT! Enter to win on THAT POST. I’m headed to Houston in the morning. Today is a packing day. And maybe some time for binding tonight. The THING on my face? What Thing?! It’s nearly gone and I’m staying the course with the antibiotics to make sure it stays that way. Hallelujah. Start the daily practice of not letting the little things bother you. If the little things ruin your day, what's going to happen when the big things come along? So happy that the BIG THING on my face is now a LITTLE THING, and not bothering me anymore! Wish we had more antiques malls to visit in Canada.I love the simple traditional patterns like the nine patch, they make you just want to cuddle up in a quilt. So glad that your medical thing is disappearing. Onto more important things..sewing and quilting and not worrying! Bonnie, it is so much fun to going antiquing with you!!! Just love poking around these shops, they is something in every nook and cranny. You know that 9 patch quilt you found... looks like it has beard protector at each ends!!! Haven't seen a quilt with those in years... fun. Each morning starts out with my coffee and reading your blog. Was thrilled to hear the "thing" on your face is gone. That is wonderful news. I am putting my borders on the MQ. It has been fun, and pushed me at times but I love it. I am doing mine 3x4 and making a wall hanging for my sewing room with a block. Have a fun and safe trip. Thanks for all you do. Once the MQ is done I am starting cutting Garlic Knots. Yippee. OMGosh.....I almost fell to the floor with laughter....'All fabric will be outdated at some point, this way I’m ahead of the game!' Those of us with huge stashes are all in the same boat. I'm buying the Garlic Knots pattern today. All the 6" units are done and sashing almost done but I feel I should support you and pay for the pattern. Thanks for ALL you do Bonnie. Thanks for taking us antique mall shopping. I wish there were some near me. It looks like a lot of fun. Your quilt looks beautiful! Can I ask what type of batting you use? I hand quilt but am hoping to do some quilting on my DSM soon. Will I need special thread for the machine too? Thanks Bonnie. I love going to the Antique Shops with you! Sad that the Minnesota didn't go home, it is a gorgeous cabinet. Doesn't the NEW Cabin need a Treadle? LOL Cool Blue Car! At first I thought the 2000 fabric was your binding! Love this column about small town. I live in North Las Vegas & miss a smaller town. In the picture of the binding are you using your 301? If you are, where did you get your walking foot? I found that feet that fit on featherweight are too short for the slant needle on my 301. Thanks. Are you going to Houston for the Super Bowl? Hope you're wearing red and black! I hate to say it but I also have some blue and white millennium fabric, love your quilt. I am so glad the "Thing" on your face is almost gone. So, you don't have to stress over it during your next classes in Houston. I will be visiting your store to buy Garlic knots, the little ruler (Even though I have one from Nancy's Quilts" in KUNA, ID. They can go together! Who knows what else I will buy? Lucky Gloria to be the winner of your Prize Bundle! Congrats, Gloria!